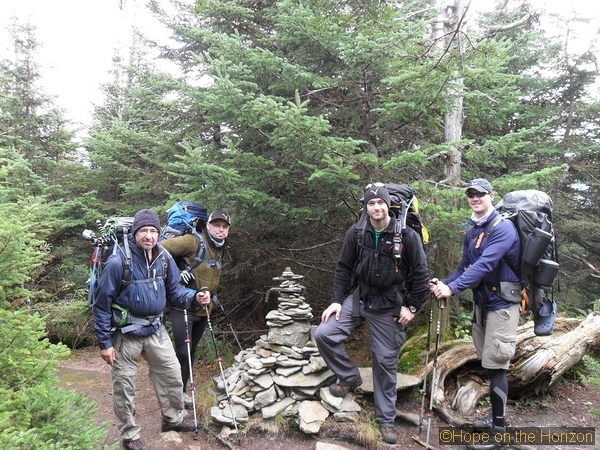 It is Sept 28 and we are six days into our expedition to raise awareness about ALS. I am sitting in the AMC Pinkham Notch Visitor’s Center between Gorham and North Conway New Hampshire, awaiting the rest of Team Horizon’s arrival. 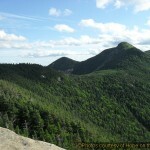 After leaving Carter Notch in the Carter Moriah Range, where we spent last night, I pulled ahead of Bob and Kirk to get down to the visitor’s center early. There I met Alex, our film maker, who was waiting with laptops and hard-drives to clear our cameras’ memory cards, charge batteries and keep up with our posts to the outside world. So far, we have had no shortage of adventure. After leaving my Jeep at the remote York Pond trailhead, we made our way into the Kilkenney Range to tackle Cabot and Waumbek, our first two 4,000 footers. Alex was with us as well, and would be for the next two days before leaving the trail to continue filming elsewhere. The weather was crisp but clear and sunny, and team morale was high. At last, we were in the mountains. Slowly we picked our way through the range, following a seemingly endless trail of moose tracks and droppings that spanned the range’s entirety, even up above 4,000. The going was slow; between the film-making and the team still getting their legs under them. 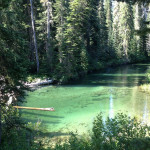 All around us were the bright colors of fall, interspersed with thick green pine or moss that glowed almost neon. 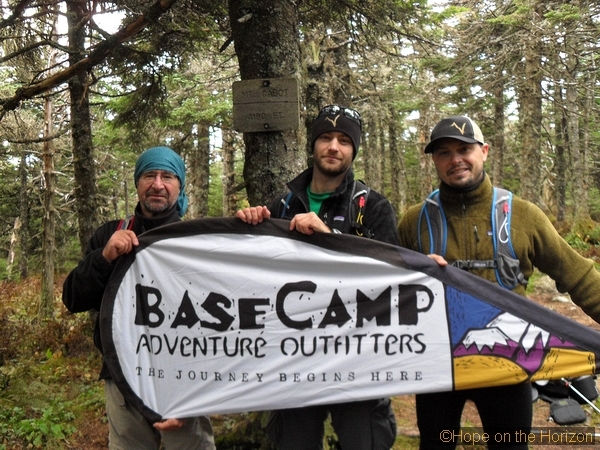 The summits were mostly wooded however, and as stunning as the views from the Kilkenneys were, the team could not help but crave the sight of the Presidentials, the largest and most formidable range in the Whites. And though the Kilkenneys were easy, they were not without cost. Bob, who had been fighting a cold since before the trip, rolled his ankle on the way down from the last peak on day two. Already, my concern for his well being and ability to finish had begun to grow. As he soaked his swollen ankle in the nearby stream we made camp near the southern terminus of the Kilkenneys with two 4,000 footers down. Day three required the least exciting effort of the entire trip. The only connection between the Kilkenneys and the Carter Moriahs, the next range we had to enter, was a twenty-one mile stretch of Route 2 also known as the Presidential Highway. After saying our goodbyes to Alex, who would rejoin us in a few days to tackle the Presidentials, we set about the unpleasant trek. The day was long and miserable and despite the paved surface, at times, the road seemed far worse than any mountain trail. 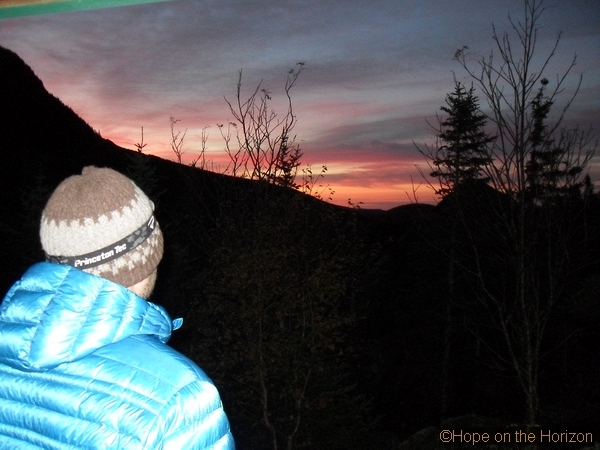 At last we came to the Rattle River Trailhead at dusk, exhausted from the day’s effort. The following morning we entered the Carter Moriahs bound for our next six peaks; Moriah, Middle Carter, South Carter, Carter Dome, Wildcat, and Wildcat D. The morning began with a light rain, seeming to signal that the range ahead would be troublesome. After passing several Appalachian Trail through hikers- bound for Maine and the trail’s northern terminus after the long journey from Georgia-we headed across the Rattle River and up toward Moriah. Kirk was instantly stung multiple times in the leg by hornets after disturbing a hidden nest on the riverbank. The going was very slow and Bob’s ankle and cough were making it all the harder for him. With each passing hour my respect for him grew exponentially. He had little outdoor experience and his ripe age of 63 was not making the endless rocky inclines any easier for him or his 50 pound pack any lighter. He persisted despite the odds and the obvious strain on him. His will was immeasurable and he had no quit, but my concern remained. Though, at the moment, he was not getting worse, his cold and ankle would not heal either. A couple days of cold rain could cause a slip, or worse, a fever. Next, it was my turn to be injured. 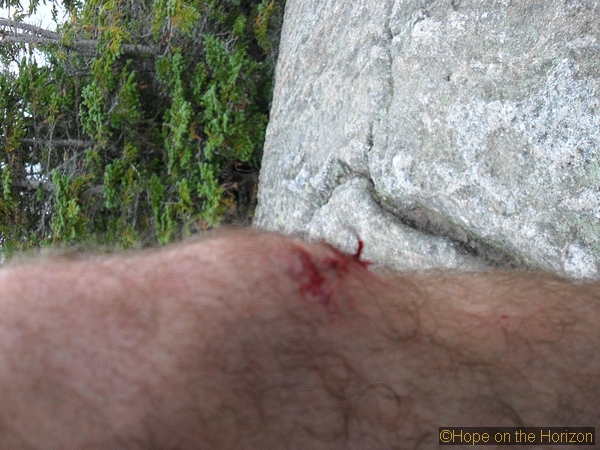 A slip of foot while paying attention to the camera caused a short but hard fall onto exposed rock, slamming both my body and pack-weight down directly onto my shin just below the knee. Blood oozed, and it quickly swelled up until it looked as though half a golf ball was sitting under my skin. To make matters worse, it took us most of the day to reach the summit of Moriah, our first of the six 4,000 footers ahead. At last we did, and took in our first true summit views of the Whites around us. Thick, white clouds swirled in and out of the red, orange, yellow and green peaks that seemed to extend for miles in every direction. Cold, piercing wind blew through us and we barely noticed, feeling as though we had at last climbed a mountain after three days on the trail. However, we could only stay so long as we were rapidly running out of daylight. Before long, we were picking our way across the northern section of the Carter Moriahs by headleamp. My swollen knee had become difficult to bend and Bob was exhausted. We ran out of water and I began to fear that Bob’s exertion had started to make him delirious. He began to lose trail, once almost wandering off the side of the mountain before calling to ask where the trail was. At last, we dragged ourselves into Imp Shelter and made camp for the night. We were very lucky. Had it been raining, things may have turned out very different. Next, one of the flux ring coils on our Jetboil melted, sticking out the side and shooting a flame out each time we heated water. Our headlamp batteries were also draining faster than usual, between the filming and the long walk in the dark. 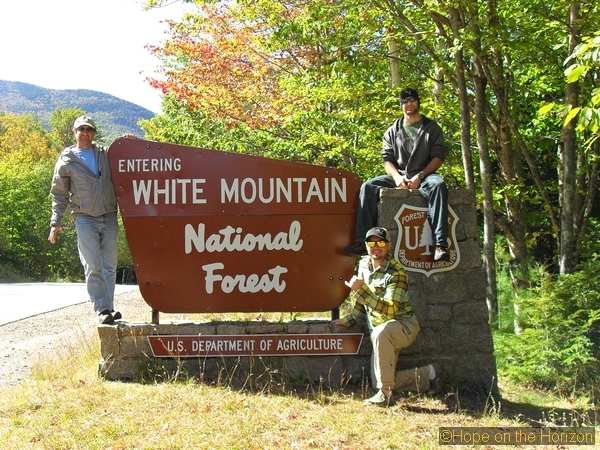 It seemed that we could not get to Pinkham Notch fast enough. The going was no faster the following two days, picking our way slowly over the Carters on first, and then across the Wildcats on the second, where I left the team to pull ahead and recharge our electronics. 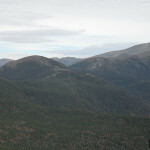 Next came the Presidentials, famous for their world record windspeeds and violent, unpredictable weather. 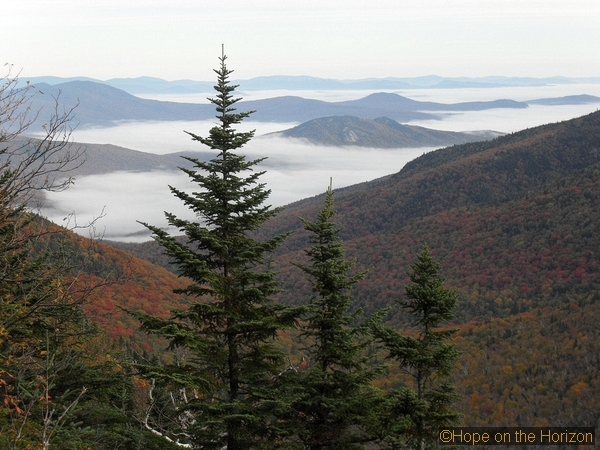 As I made my way down and into Pinkham Notch, I could not shake the sinking feeling that was wrenching my gut. Despite Bob’s incredible effort and spirit, his health had not improved, nor had the team’s speed. We were moving at less than one mile an hour, far too slow to make the 48 in the time frame we had set. We received word that morning that bad weather was moving in and would hang over the Presidentials for the next couple of days. To get caught in a storm up there and not be able to retreat as quickly as possible could be dangerous, even disastrous. So far we had been lucky, but luck was a foolish thing to rely on in the mountains. 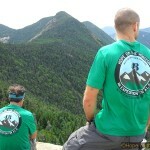 Editor’s Note: The Hope on the Horizon Team began their journey to conquer the 48 peaks of New Hampshire in an effort to raise awareness for ALS. This is their first report from the trail. More will follow in the coming days. Go team HOTH!